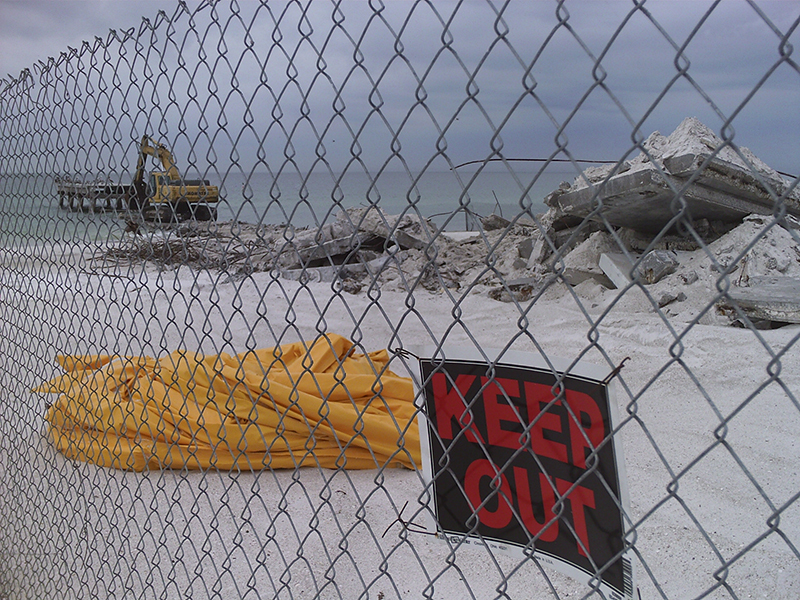 The demolished Manatee Public Beach pier has gone from beloved landmark to historical question mark. It is gone, probably forever, according to city and county officials, but not forgotten. Mayor Bob Johnson said he isn’t sure why the structure lost its cache with the Holmes Beach Commission, which voted unanimously March 1 not to resurrect the 300-foot-long pier on the Gulf of Mexico at the Manatee Public Beach. In voting down the pier, commissioners said they weren’t interested in building such a large structure on the beach, the mayor said. Resident Beverly Neville pleaded March 27 for commissioners to ask the public whether the structure should be rebuilt. Neville said few people in Holmes Beach, if any, knew city commissioners would reject rebuilding the pier. The pier is on a county-maintained beach, not a city beach, Neville reminded the commission. 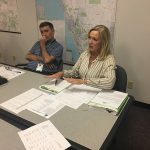 Holmes Beach Commission Chair Judy Titsworth said she would “have no problem with a survey” of island residents on the issue. But support is scant, she added. The city commission vote was spurred by a query from Manatee County Commissioner Carol Whitmore, a former Holmes Beach mayor and commissioner who asked if her hometown wanted help with funding to rebuild the pier. Whitmore said she was following through on a promise made by the county to the city and citizens to rebuild the pier. Whitmore said she believed it appropriate to solicit a policy decision from the Holmes Beach commissioners regarding the pier. She was saddened and surprised by the negative response, she said. Whitmore once sought to have the pier named for a popular lifeguard at the beach, Mike Miller. Whitmore’s request was unexpected, Titsworth said. The once-popular Holmes Beach pier was closed for good after an engineer’s report deemed it unsafe in February 2009. Manatee County commissioners unanimously approved a proposal March 3, 2009, by county natural resources director Charlie Hunsicker to replace the failing structure with a new pier — jutting farther into the Gulf and taller. The closing was unpopular but not unprecedented. 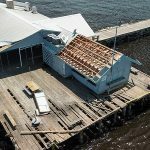 Tourists and residents complained about losing an ideal spot for walking beyond the shoreline over the water, enjoying sunsets or fishing in the deeper water of the Gulf of Mexico, but the pier had been closed before and rebuilding it seemed a foregone conclusion. The pier also was closed to pedestrians in fall 2006 out of concern for eroding structural supports. The 18-foot-wide pier reopened to foot traffic in spring 2007, but the area under and around the pier remained closed to swimming. After the pier was closed again two years later, plans to rebuild were devised. According to The Islander’s archives, the county commission at the time fully intended to replace the pier. The city commission and public support ran in favor of a new pier. Reconstruction costs were estimated by Hunsicker at $1.5 million to $2.5 million plus $100,000 in planning and permitting fees. He said it would take about five months to secure permits and another six months for construction. Hunsicker projected at the time the new pier could be ready by January 2010. Whitmore, chair of the Manatee County Tourist Development Council, said at the time the TDC could provide $1.4 million and county revenues would cover the rest. Momentum stalled as funding was more difficult to find than expected following the Great Recession. The county commissioners voted to replace the pier, but a 2010 county permit to rebuild expired without action in 2015. Nearly a decade after the pier was closed, all reconstruction plans have failed. The pier remains a memory unlikely to be reassembled after the latest rejection by the city commission. “It just seems as if all the support to rebuild the pier has gone away,” Titsworth said.